When we're looking at this part of the country, the Northeast, what is already happening with climate change? What we've seen already in the Northeast in terms of changing climate are sea level rise, for one. We've had about eight inches to as much as a foot of sea level rise in the Northeast, which is already leading to more frequent coastal flooding events. We're also seeing increases in average temperature. We've seen winter temperatures, for example, go up. And we've seen more frequent heat waves, fewer really cold air events, as those temperatures rise. One of the big trends that we've seen in the Northeast, which may partly be just natural variability, is a trend toward a lot more frequent heavy rain events. Average rainfall in a year or in a winter is going up a little bit, but what's really changed in the last 50 or 60 years is a 70 percent increase in those days with really heavy rain. And a key research question is how much of that is natural variability versus a change in climate. 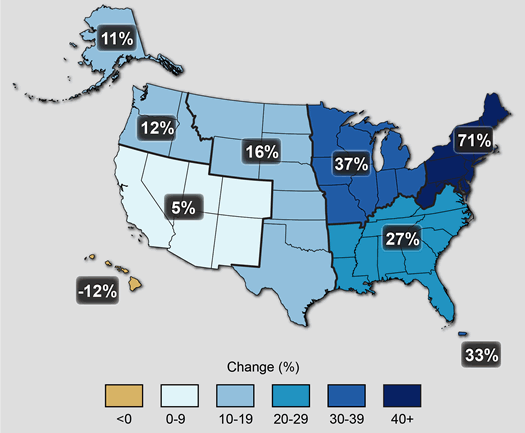 This map is from the the National Climate Assessment report released by the federal government in 2014: "The map shows percent increases in the amount of precipitation falling in very heavy events (defined as the heaviest 1% of all daily events) from 1958 to 2012 for each region of the continental United States." So as we look to the future over the next half century or century, what are some of the changes we might see? Heading out for the next generation or so, to 2050 or so, we can expect to see much more frequent coastal flooding, even if storms don't change at all. Even if the hurricanes or Nor'easters we've had in the past stay the same, just by virtue of rising sea level -- by the one to two feet that we expect -- that's going to mean for some of our coastal locations that flood events that used to happen once very 50 years are happening maybe once very 25 years. It's a noticeable difference -- it starts to get you within the lifetime of the traditional home mortgage, for example. We also expect to see more frequent and longer duration heat waves. Heat waves are the leading [weather] killer in a typical year in the US, and we're real concerned that heat wave frequency, intensity, and duration -- heat waves that extend over nights, for example -- could become more common, which could lead to loss of life, especially in those communities that don't have air conditioning. 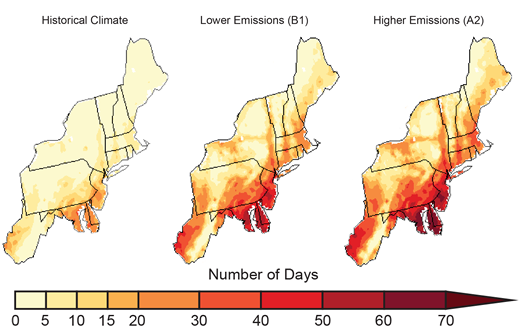 Another map from that National Climate Assessment report: "Projected increase in the number of days per year with a maximum temperature greater than 90Â°F averaged between 2041 and 2070, compared to 1971-2000, assuming continued increases in global emissions (A2) and substantial reductions in future emissions (B1). (Figure source: NOAA NCDC / CICS-NC)." I think there's a risk of continuing trends toward more heavy rain events. Flooding a lot of our key infrastructure. Causing our wastewater plants to overflow, fouling our waterways. Causing a lot of flood damage. That's certainly a big concern. We're also gradually starting to see some changes in our ecosystems. Again, it's hard to say how much of that is climate change, but certainly there's concern. Just to to give one example, some pests species -- like the southern pine beetle, which has been a major forest pest in the southeast US -- a question is as temperatures rise and we get fewer of these really cold nights in winter, temperatures aren't going down below, say, zero as often in the future, are some of those pests that have historically been constrained by really cold temperatures going to creep farther north and start to invade our forests in the Northeast. I thought it was interesting in your presentation that you were talking about how people hear average temperatures might increase by one or two degrees and that might not sound like much, but it shifts the whole distribution of temperatures and those extreme events become much more common. And that's where the real danger is. You're absolutely right. Small shifts in average conditions can have a big impact on the frequency and intensity of extreme events. And extreme events like really high temperatures, like coastal flooding, are what we experience. We don't really experience the shifts in average temperatures. It's the extreme high temperatures, the extreme flooding that impact our homes, our infrastructure, cause loss of life. We need to adapt and prepare for that. Especially in place like Upstate New York where our [collective] sense of it is that it's pretty temperate. And thinking about a future where we might have summers where maybe it's 95 degrees for a week and how people react to that and adapt to that. Yeah, as we get farther out this century, especially if we continue to emit greenhouse gases at high levels, we could experience climate features that are more like the Mid-Atlantic or even the Southeast. It's always perilous, to think about how we might respond to something we've never experienced. To use just one example: In the far north of New England, there's probably always been an assumption that you'd cool off at night, that you wouldn't need air conditioning at night. Or that if you did get a really extreme heat day, it'd probably just be one day, two days or three, and then it breaks. But as those extremes shift, we might not be able to count on those kinds of bailouts. And we might find that just a couple of degrees of warming at that extreme tail -- so it's 98 instead of 96 -- may have real noticeable impacts on energy use, how the soils dry out, and human health and probably wildlife species as well. There's sort of this cultural aspect of climate change, as well. Here we don't have this collective experience or knowledge of dealing with really extreme heat. And there's going to be that period of change where we acquire that, and unfortunately bad things are going to happen in the interim. That's a really interesting point. I guess it's a question of how much can we adapt without actually experiencing some of these things. The hope is that the changes might come gradually enough that you can sort of prepare as you go. But we know that even separate from climate change that natural variability can give you big surprises -- 1-in-500 rain storms tomorrow. And climate change, for a lot of these types of extremes, is just going to increase that risk. Can we as a society develop some tools to try to prepare before the disaster? To some extent I think we can. But I think your basic point is right. It's very hard for people to prepare for what they haven't experienced. 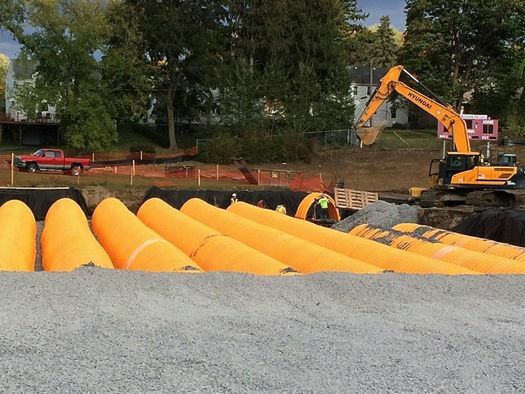 A new stormwater retention project that Albany Water Department has been building along Woodlawn Ave in Albany this year -- the hope is the project will allow one of the city's main sewer lines to better handle large rainfall events. So for local leaders in this area, and just for regular citizens, what are the questions we should be thinking about in terms of adapting? Heat events are on my mind because that's the subject of the talk. As I said earlier, we tend to underestimate the dangers of extreme heat. And there are some pretty simple steps we can take to reduce the risk a little bit. One of them, somewhat ironically, is air conditioning and cooling centers for the vulnerable populations in urban areas. You can minimize the risk of death. So I think that's a critical step, even though it can be associated with more greenhouse gas emissions, unfortunately. I think public advisories and campaigns, anything we can do to send out heat wave warnings, to get those broadcasted in the media. And also to do public health campaigns that tell people about these dangers. And there are little things that individuals can do, checking in on neighbors who are the most vulnerable, for example, taking precautions about being outdoors in extreme heat. And then there are design-type solutions, envisioning cities with more shade, building designs that can have airflow and cooling. So there are steps we can take. Albany is always last out of the gate on any kind of new thinking on these types of issues. Maybe its our terrible political culture. There is a variety of measures we can take to mitigate the flooding problem locally. rebuilding our combined sewer/stormwater system is prohibitively expensive and, although I am glad the city is taking some action in that area, there are so many other, cheaper things we can be doing. other cities are acting. The picture above has less to do with so called "climate change" than it does with crumbling infrastructure.....can't deny! @BS: You must have skipped the part about science indicating that extreme weather will occur with greater frequency, including but not limited to intense rainfall. "The picture" (of flooding) has multiple factors. 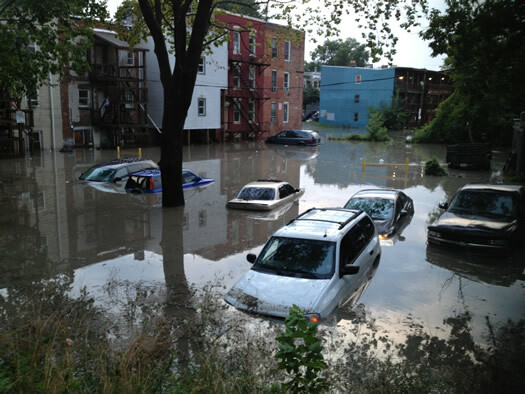 There's a point where the storm water & sewer system clearly fails to handle it. Has it's ability been reduced over time or has the weather become more extreme? Probably some of both. I'm not an expert on either, so it would be wrong to deny it's not part of the problem, even a large one. But it's just as wrong to say it is the problem without supporting information. Without professional analysis and evidence, I could deny just as readily as you claim I can't. Heavy rainfall event + insufficient infrastructure = flooding. As described in the interview, one of the already observable impacts of climate change in our region is an increased frequency of heavy rainfall events. Also, brand new infrastructure that isn't designed with climate change in mind could be just as insufficient. When reading posts on controversial issues, I find reasonable, rational comments are far more persuasive than simple, snarky comments.